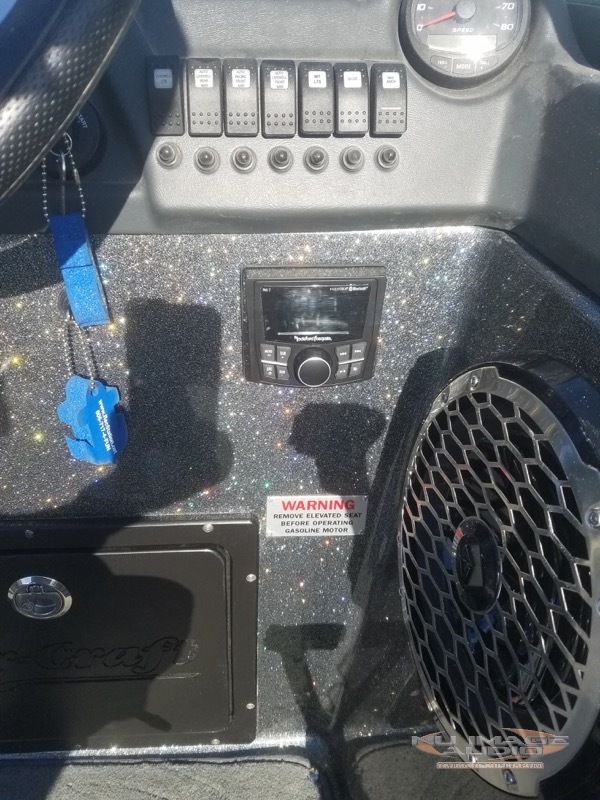 A client from here in Salina, Kansas, brought his 2016 Yar-Craft fishing boat to Nu Image Audio for a stereo system upgrade. The client plans to make fishing his top priority once he retires. He may even enter a few professional fishing tournaments. The Yar-Craft is the Rolls Royce of fishing boats. 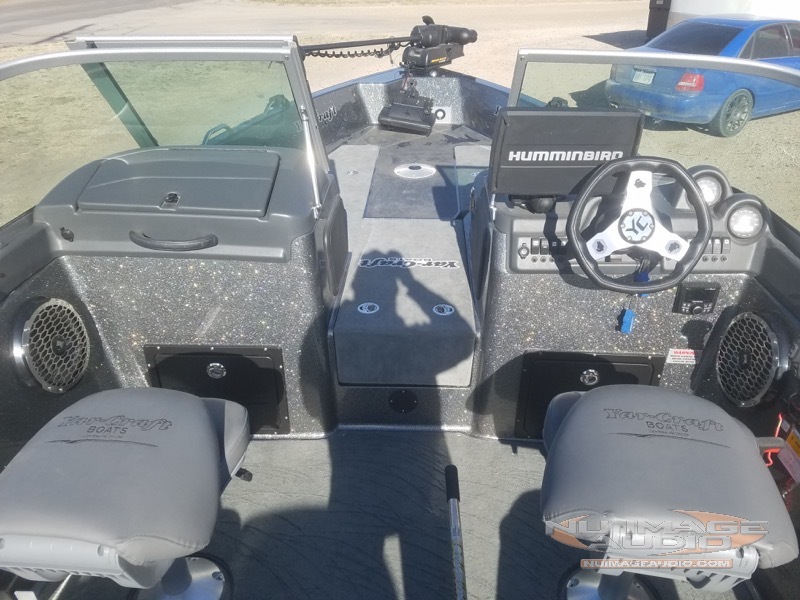 The boat features more than 300 horsepower, three 10-inch Huminbird fish finders, GPS-base trolling navigation and more storage than a modern mini-van. The boat has everything – except an audio system. The client asked for a system that would be as awesome as the rest of the boat. We looked over the layout and made a proposal that would provide crystal-clear sound, even at 65+ miles an hour. The client gave our plan the thumbs-up so we scheduled an appointment to begin the installation of this new Yar-Craft stereo system. The client has lots of audio options now, thanks to the Rockford radio. We installed a Rockford Fosgate PMX-3 digital media receiver on the right side of the steering wheel. The PMX-3 includes a 2.7-inch LCD screen and is fully water-, salt- and UV-resistant. Bluetooth audio streaming, USB phone charging and media playback, and an AM/FM Weatherband tuner with RDS are just a few of the audio source functions provided. The client intends to stream music from his smartphone, so he can easily choose what track he wants to listen to from anywhere on or near the boat. Should the client want to expand the system later, he can add a wired remote control on the bow or stern. The Rockford Fosgate amplifier powers the entire system. We mounted the amplifier in an out-of-the-way spot. We installed a Rockford Fosgate PM1000X5 amplifier in the main storage locker across from the helm. The PM1000X5 is a five-channel amplifier that produces up to 75 watts per channel for the front and rear speakers and 500 watts into the subwoofer channel. The Rockford amp is designed for marine applications. The circuit board has an epoxy coating to resist corrosion in high-humidity environments. The chassis and all the hardware is aluminum and stainless steel. We used Stinger accessories to wire up and connect the amplifier and speakers. Since the boat wasn’t designed for an audio system from the factory, we had to run speaker wire to each location. If you have watched your installer run wiring on a boat, you know it’s no easy task. We ran 4 gauge power wiring from the trolling motor battery for the amplifier, and protected everything using a Stinger circuit breaker. The boat has two isolated battery banks onboard. The main starter battery is isolated from the trolling motor batteries so the engine can be started any time to recharge the entire system. We chose a solid location for the subwoofers. The subwoofers are mounted on a spot in the boat that is over an inch thick! Our technicians had to cut holes in the rear for the speakers. Adding more speakers requires cutting more holes. Fishing from the front of the boat never sounded better! The rides to find the fish have just gotten much more enjoyable. We installed two pairs of Rockford Fosgate PM6252B 6.5-inch coaxial marine speakers. We located the front speakers on either side of the forward fishing platform. The rear speakers are also in the hull, just behind the rear seats. To ensure a perfect installation, we purchased a hole saw that fit the speaker cutout perfectly. Some shops would accept using a saw of any kind. We don’t take shortcuts. To give the system a little extra kick, we installed a pair of Rockford Fosgate PM210S4B 10-inch subwoofers on either side of the main cockpit. As you can see from the photo, the hull is extremely thick at this location. The fiberglass was nearly 2 inches thick, but we took our time with our Rotozip and worked through the material methodically to ensure a perfect opening for the sub. A benefit of this material is that the subwoofer will have a solid and stable foundation on which to operate. The result will be tighter, more-controlled bass performance. All of the speakers are from the Rockford Punch Series and include 100% UV-stable designs that have passed the industry-standard UV and salt-fog exposure tests. Once we finished installing everything, we used our oscilloscope to set up the amplifier. Setting the sensitivity controls this way not only protects the speakers from being over-driven but also maximizes the signal-to-noise ratio of the system. All cleaned up and ready to hit the water! When the client returned to Nu Image Audio and listened to his new sound system for the first time, he loved the way it sounded. If your boat needs an audio system upgrade, drop by our store. You can also reach us using our online contact form.